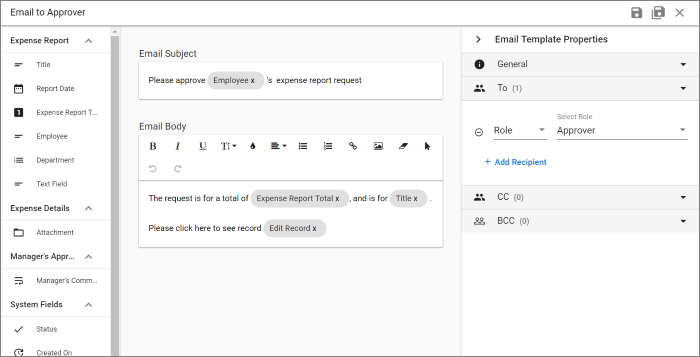 The Email Template Editor allows you to create the Subject and Body text for your email and specify all the recipients. (Left side list) A list of the available form fields and links that can become part of the email message. To add a field or link to the email, drag-and-drop it from the left into either the Subject or Body sections. Email Subject Type any subject text you would like, along with fields and links from the palette on the left. Email Body The body can also include text, long with fields and links from the palette on the left. Unlike the Subject, the Body can also include formatting such as bullet-point lists, font effects like bold, italic and colors, and the inclusion of images and links. Email Template Properties Define the recipients of the email, along with some general settings. You select recipients for To, CC and BCC in the exact same way, as outlined below. Click to remove the associated recipient. Click to add another recipient. Role Select the desired role from the provided list. User Entered the desired user’s email address in the provided field. These can be used in any combination, e.g. To could include two roles, three users and a field.